Hidden away off the beaten tourist tracks, down little side streets, there are an infinite number of truly Barcelona recesses that people often know nothing about, even those who live here. Squares, cloisters, alleyways, walks and paths that belong to another era and evoke a Barcelona that, at first sight, appears not to exist: one that maintains the essence of the town or village that every city neighbourhood used to be. Even in the most central ones, the old quarters like the Gòtic and the Ribera, you can find squares that do not even appear on tourist maps. And in the end, that is the essence of your trip: letting yourself be led by your intuition, zigzagging through streets that turn into mazes, to finally discover Barcelona belongs to locals and visitors in equal measure, and that it always, always keeps some little corners which let us really be ourselves, wherever we are from. You will find places that kindly invite you into a quiet retreat, like the patio at the Convent de Sant Agustí, in Ciutat Vella, and squares full of life and people, cafes, restaurants and shops, where people live their lives every day, such as Plaça de la Vila de Gràcia. Or paths and walks that take you back to the city's medieval past, like the old Rec Comtal irrigation canal, through which the water that once supplied the city flowed. Pretty little corners too, such as Plaça de Prim, in the heart of Poblenou. If you leave your compass at home and wander round the city, you will find hundreds more that will captivate you. A square with a Parisian touch, almost melancholy, but the hidden heart of the Sant Pere neighbourhood. It still has a medieval archway, just where Carrer del Portal Nou starts, although most of the buildings date from the 18th and 19th centuries, the golden age of the Catalan textile industry when this was a bustling quarter. These days it is covered with modern paving stones and surrounded by shops and restaurants serving traditional fare. Flanked by some of the remains of Barcelona's Roman wall, including a circular tower, Plaça dels Traginers alludes to the Regomir quarter's medieval past: the place where the city's communications routes began. The carters (traginers) no longer take their goods to the square but it is still a lively place, and a meeting point for local musicians and painters who give it an air of bohemian charm. You will find this quiet little square, opened in 1963, next to Plaça de Sarrià, the main square in the neighbourhood. To the side stands Sant Vicenç, a Neoclassical church preserving a Baroque altarpiece devoted to the Virgin, the Mare de Déu del Roser. Compact, tree-lined and traffic-free, the square is frequented by children but there are also lovely spots where you can enjoy the shade and read, along with some nice terraces for an aperitif. This pretty porticoed square dates from the middle of the 19th century, when the Sant Andreu Town Council planned to locate the market there. Until well into the 20th century, when the Mercat de Sant Andreu was given its current metal roof, it was a meeting point for farmers and travelling pedlars. Today it is still a prized spot, maintaining its commercial, lively, small-town character with bars and shops under the arches. In times gone by, Plaça d’Osca was the site of the bustling Sants neighbourhood market. Probably that is why it retains its lively, popular spirit: it is a neighbourhood meeting place strongly admired by the locals. The square, closed to traffic and lined with trees, is surrounded by all kinds of bars. Its terraces are in heavy demand for pre-lunch drinks and on summer evenings when there is a breeze blowing across it. Anyone who lands in Plaça de la Concòrdia immediately recognises Les Corts used to be a town and this was its main square. Closed to traffic, it is surrounded by 18th and 19th century buildings, and there are even some period shops, such as a chemist's and a cake shop. The gem of this little enclave is the Modernista mansion, Can Deu, now a civic centre with a fantastic, landscaped interior courtyard. If it was not for the fact that there is no perimeter fence impeding access, anyone would think that Plaça de Sant Gaietà was a private patio. It is a tiny square, covered in red tiles and surrounded by flowers, with a pretty bougainvillea. The people who live in the ten little houses around it are privileged indeed. Known as el raconet, the little corner, it is a romantic spot, hidden away like few are in Barcelona. “Plaça de la Vila de Gràcia” is a new name for a square that has had lots of different names throughout its history and it is still called “plaça d’Orient” by a lot of people. Right in the middle there stands a clock tower, 33 metres high, which is crowned by a bell known as the “Marieta” that still rings. The square, surrounded by bars, restaurants and shops, is a local meeting point and always full of life. In the 16th century the urban centre of the small town of Horta developed around this square. At the beginning of the 20th century, when Horta was annexed by Barcelona, the big city gave it a fountain, an exact replica of the Font de Canaletes on the Rambla that still spurts out water today in Plaça de les Santes Creus. It is a little paradise, surrounded by low houses and with plenty of shade under its trees. Plaça de Masadas, at the heart of La Sagrera, was built at the end of the 19th century and is one of the few porticoed squares still left in the city. For much of the last century there was a covered market there but it was pulled down in the 1990s and the square was opened up again to the public, as it is today. The first Sunday of every month there is a market selling old toys which is a real delight. Plaça de Prim has the oldest houses you can find in Poblenou, a neighbourhood with a seafaring past. In years gone by they were inhabited be fishermen. The square is simple but charming, with three ombu trees, a fountain and just one restaurant which, needless to say, cooks seafood. The area round it is a must too, with low white houses and quiet streets. A peaceful haven in the middle of the city. The 12th century Santa Anna church is a survivor, still standing among the modern buildings that surround it. The main nave leads into the cloister, a Catalan Gothic construction notable for its simplicity. This little paradise, containing a central garden with some wilder touches, can be entered directly from the street. A visit is a must if you want to escape the noisy streets around it. The old Hospital de la Santa Creu complex is one of the most magnificent constructions of Catalan civil Gothic architecture. One of the unique buildings in the complex is the old Casa de Convalescència de Sant Pau. Taking the steps from here you reach the central cloister, also Gothic and which is an impressive sight. The heart of working-class Raval is where you will find one of the best-preserved Romanesque buildings in the city: the old Benedictine monastery, Sant Pau del Camp. And from the Gothic-style chapter house you enter the tiny cloister, unlike any other in Europe because of its unique arches. A delightful, charming place where silence reigns. Barcelona's medieval Royal Shipyards, rising up in the heart of the city's maritime facade, were built in the 16th century in the Gothic style, as a copy of the 14th century original. Today they house the city's Maritime Museum. The hallway leads to a huge central courtyard, part of what was once the large courtyard of Peter the Great. In the background is a facade containing a large portal with a voussoir arch. A visit here takes you back in time. The Gothic cloister and part of the building are all that remain of the old Sant Agustí Convent, which dates from the 14th century. It was demolished to make way for a military barracks, following the siege of 1714. Now restored, it is a very active civic centre and, hidden under the cloister arches, there is a bar with a magnificent terrace for having a drink. The Església de la Puríssima Concepció, on Carrer d’Aragó, was built in the 13th century as a convent for nuns on what is now Via Laietana. But when the city was redeveloped in the 19th century, the church and the cloister had to be dismantled and taken to their new site, block by block. The 14th century cloister has two levels with galleries, and a garden that invites meditation. The impressive Palau Robert, an early 20th century mansion, stands in a privileged spot on Passeig de Gràcia. Its gardens are an oasis and you get an inkling of that from Avinguda Diagonal. Offering places to sit in the shade, they were first remodelled at the start of this century. They can be entered from Avinguda Diagonal or the Palau hallway. Nobody could imagine that Portal de l’Àngel, one of the city's busiest thoroughfares, could harbour a spot like this. The Àngel garden, which is open to the public, forms part of the Hotel Catalonia Albinoni, a small 19th century mansion. The courtyard has a terrace decorated with wood, palms and other plants, where you can eat tapas. There is also a glass-covered pergola. The walls, decorated with large painted murals, add a touch of colour. These gardens, which contain the well-known and much-appreciated Eixample beach, are one of the first Eixample block interiors reclaimed for public use, in line with the original idea of the town planner Ildefons Cerdà, who created the neighbourhood. The brick tower, dating from the end of the 19th century, still works and provides the water for the pool that is open to the public during the summer months. The gardens of the Palo Alto Foundation, which occupies an old factory site dating from the end of the 19th century, are spectacular. Lush, leafy vegetation is everywhere. It even covers the building facades. There is also a vegetable garden and a canteen where you can eat lunch. The current tenants, some 20 companies involved in artistic creation, have turned this industrial complex into a real little village. As the English say, it is a must. A Neoclassical building converted into the Hotel Petit Palace Opera Garden, on Carrer de la Boqueria, conceals this exceptionally romantic garden. It has been listed by the City Council and is open to the public. You need to go through the hotel reception to reach it. Awaiting you are a dozen oriental trees and various geometrically shaped flowerbeds. There is also a terrace where you can have a drink and a bite to eat. You won't get to this little lane unless you go there on purpose. It is hidden behind Carrer de Rossend Nobas, next to El Clot's busy market. Unpaved and lined by a row of small houses, it has survived intact over the years as proof of the neighbourhood's rural past. The residents take great care of it. In the summer they get together for a social chat outdoors, as in times gone by. This path through La Clota used to link the village of Horta with the Sant Genís dels Agudells church at the foot of the Collserola range. The section from La Clota to Avinguda del Cardenal Vidal i Barraquer has been preserved, along with another that goes to Avinguda de Martí Codolar, which retains its old, rural air. In the heart of Sant Andreu, between Carrer d’Agustí Milà and Carrer Gran de Sant Andreu, you can step back in time. Carrer de Grau is an L-shaped street in the style of the old quarters in some of the Maresme towns, one of the few remaining in Barcelona. There is a row of houses on one side and gardens and vegetable patches on the other. A real attraction. This is named after Antoni Mulet i Orfila, the professor of painting who owned it from 1868. It was Mulet who opened up this path to the bottom end of the Putxet neighbourhood, where he had some 20 houses built. You can still see a few Modernista houses next to some very modern ones. It is undoubtedly one of the passages with the most tradition in the city. Opened towards the end of the 19th century, this passage housed manufacturing workshops in what was then the industrial neighbourhood of Sant Pere. It is a kind of illuminated tunnel that provides a shortcut between Carrer de Trafalgar and Carrer de Sant Pere Més Alt via some steps. These days the manufacturers' shutters remain closed and there are only a couple of bars left. Despite its rundown appearance, it is still worth taking this shortcut and giving your imagination free reign. You can still see the wells and sinks that Horta's washerwomen used for almost two hundred years, from the 18th to the beginning of the 20th centuries. Horta was a water-rich neighbourhood, so the women used to wash the clothes of the city's wealthy families. The eight houses still standing on this street preserve the well, the laundry sink, the yard and the vegetable patch. The path the Carrer d’Aiguafreda washerwomen took to Barcelona is still there too. The Torre Baró-Vallbona neighbourhood is where you will find the only open-air stretch of the old Rec Comtal, an irrigation canal built in the 10th century that made use of the route followed by a Roman aqueduct in disuse. It covered 12 kilometres, started in Montcada i Reixac, and supplied water to the walled city and the orchards on the Barcelona plain. Now this walk through the city's medieval past is a sheer delight. Coming down from El Coll, and just before the Vallcarca Viaduct, you come to Plaça de Mons. It is a small, stone square. In fact it serves as a roundabout where the streets up to El Coll and those down to Putxet and Vallcarca start from. There are still a few Modernista mansions here as well as one in the rationalist style that stands out because it is shaped like a boat. 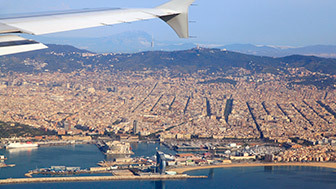 The views of Barcelona from the viaduct, towards the sea and the hills, are exceptional. 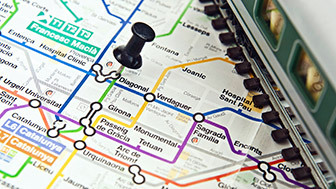 Satalia is a neighbourhood within a neighbourhood: a small community in Poble-sec, separated by Passeig de l’Exposició. A neighbourhood the residents are proud of that climbs up Montjuïc, with steep streets and lots of steps. The 19th century houses still have their vegetable gardens and the backyards with their marvellous views. Very close by there is the Mirador de la Satalia, a 4,000 m2 viewpoint with benches, tables and a kiosk-restaurant. This is one of the streets most used by tourists who come to Barcelona, because it leads to Park Güell. It is called a baixada (downhill) but the truth is it goes up as much as it goes down. The slope is 35% and since the end of the last century it has had escalators, a typical feature of the neighbourhood, to make life easier for residents. When you reach the top it is worth stopping to catch your breath and enjoy the views of the city. They are breathtaking! At the foot of Montjuïc Castle, in Carrer dels Tarongers, there is a spot that conceals a pleasant surprise for young and old alike: two big slides with a steep gradient, right in the heart of nature. The descent is dizzying: if you are of a nervous disposition, you will have to brake before the end. Obviously, the views from there are spectacular. It is impressive. 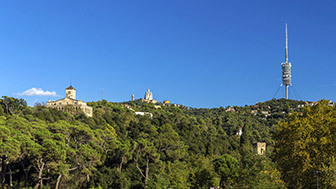 It is not for nothing that the Font de la Budellera is the most popular fountain of all those preserved in the Collserola Natural Park. Surrounded by perfect stone walls and lush vegetation, this is a very pretty and welcoming spot. The Budellera stream starts here and flows into the Vallvidrera gully. Highly recommended. The water that supplied Sarrià from the middle of the 19th to well into the 20th century came through the Mina Grott, a 1.5 km tunnel. An attraction was built there at the start of the last century known as Lake Valley, with an electric train that took passengers through the illuminated tunnel. It was a big success but closed in 1916. The Mina Grott is on the Vallvidrera Reservoir Path, a really beautiful spot.